Explanation: The candy-dish appearance of this high-tech astronomical mirror is striking. Made of a special glass ceramic material called Zerodur, it actually measures 2.7 meters across. 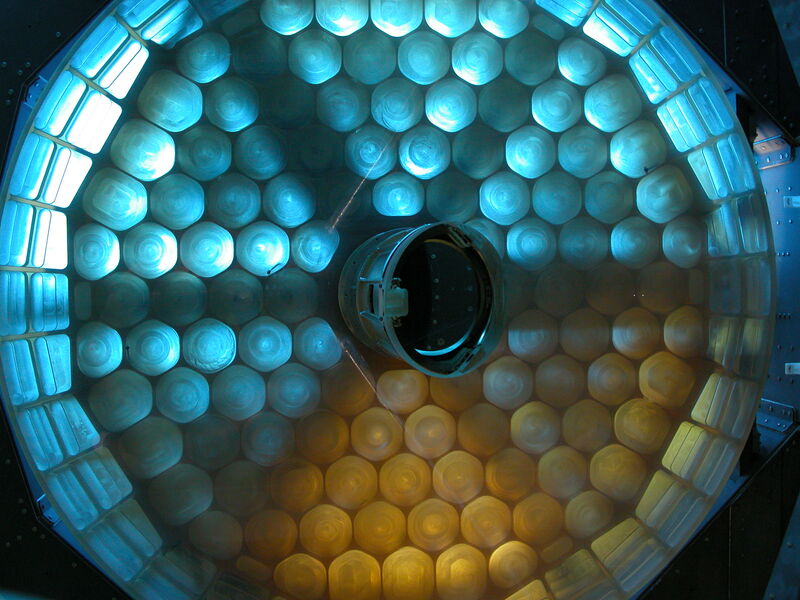 The transparent surface has not yet received a reflective coating, so the weight-reducing internal honeycomb structure is visible with attractive blue and yellow tints provided by a protective tarp and background lighting. Recently unveiled, the telescope mirror is destined to fly on the Stratospheric Observatory For Infrared Astronomy (SOFIA). Since water vapor in Earth's troposphere tends to block infrared light, SOFIA will operate from a modified Boeing 747 jetliner at altitudes above 40,000 feet. As the largest airborne observatory in the world, SOFIA will explore a host of cosmic environments including sites of star birth and death, the formation of distant solar systems, and black holes in active galaxies.